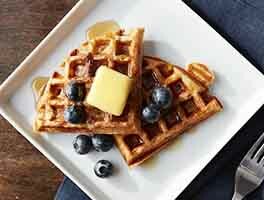 These light, delicious waffles call for only four ingredients and a waffle iron. Since they can be served as breakfast or brunch, dessert (under ice cream, fruit, whipped cream, and/or chocolate sauce), and even as an accompaniment to a dinner or lunch of fried chicken, you can demonstrate your lightning-fast waffle-making skills any time of the day! Preheat your waffle iron as directed. 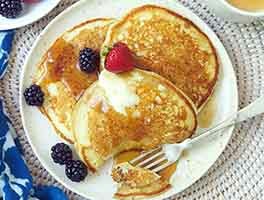 Lightly grease with non-stick vegetable oil spray, or melted shortening. Beat together the milk, eggs, and butter in a medium-sized bowl. Stir in the flour; a few small lumps are OK.
Yield: six 6" standard (not Belgian) waffles. I read all of the earlier reviews but thought that I would try the recipe also. I weighed all the ingredients so there were errors made by me. The resultant waffles were somewhat tasteless. I don't know what could be added to the recipe. The waffles were not exactly dry but somewhat breadlike, as someone else put it. Maybe I am somewhat spoiled because I usually make waffles from your sourdough recipe. KA recipes are usually spot on. This one misses the mark by a long shot. I purchased self rising by accident, I figured I would give it a try. Dense and tasteless, even added extra liquid. Pass on this one. Got a waffle maker for Christmas. Used up all our boxed waffle mix and decided to try making them from scratch. So disappointing. We are calling them "waffle bricks". There is no light fluffy interior, no crispy exterior. Just a dense, bready brick. Looking elsewhere for a go-to recipe. Carefully measured, etc, still quite awful. I've found success with every recipe on this site, but this one's a dud. Definitely go for the 'worlds best waffles' one instead. Well worth the additional time and ingredients. These waffles are tough and tasteless. I measured exactly, mixed gently until just a few lumps. I am an experienced baker. I gently sifted the flour into the measuring cup and leveled off. So it's not a matter of too much flour. I used king Arthur self rising flour. It was perfect. 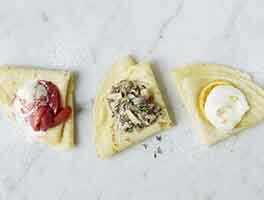 I love simple and easy recipes for a quick meal. Try topping with chocolate gravy: 2 cups milk 4 tbsp bensdorp chocolate 4 tbsp sugar 4 tbsp ap flour Whisk in a saucepan until smooth and creamy. This was the perfect topping for a great waffle. 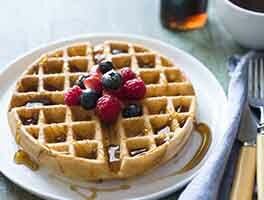 I adjusted this recipe after reading reviews and the waffles were perfect! I added 1.5 cups of cocunut milk instead of 1 cup of milk. Then it was not too thick. I added 4 teespoons of vanilla extract and added 3 single serving packets of Stevia (sugar substitute) to give them better flavor. Everything else I kept the same. They tasted great and turned out perfect on our new Belgium waffle maker. I read the reviews that resulting waffles were too thick, too tasteless, etc. I have waffle maker I've never used, so ... I weighed all ingredients by grams. Also added about teaspoon of vanilla, some cinnamon and a bit of sugar. And extra milk - I live in Phoenix - everything here is dry but the bars. Waffle batter and waffle texture was great. The taste still needs some oomph. Maybe some espresso powder- love coffee flavor. A little dry, so maybe a bit more liquid, although more fat would be tastier, easier and better tasting, but less healthy. Way too thick. I measured carefully. Waffles were dense and lacked flavor. I threw out rest of batter. 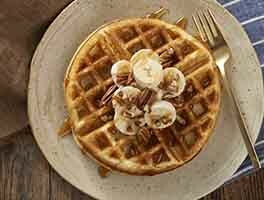 My daughter requested a waffle with peanut butter before her basketball game this afternoon, so I needed a quick and simple recipe. This was just right. I didn't have time to read reviews but could tell from the list of ingredients that I should keep my expectations low, flavor-wise. I decided to stir in a little vanilla & sugar, a big spoonful of sour cream (I don't really know why), and a bit of milk to thin it out some. The waffles had a beautiful, golden, crispy exterior and were fluffy inside, just the way we like them. And very easy, which is what I needed for today. I will definitely whip up a batch of these again without hesitation. They're an excellent base.